Hello and welcome to my blog. My name is Katie. I am married to Mr. Ginger, and we have two ginger daughters, Ginger #1 and Ginger #2. We live happily in Northern California. I never ever thought in a million years that I would be a quilter. I have a degree in Computer Science and a pilot's license. Neither of those things lead to quilting, but quilting came to me. I started sewing in 2008 after my oldest daughter was born. I bought my sewing machine from Wal-Mart on a whim. I was only going to use it for zig-zag stitches on my baby's scrapbook pages. Then I started sewing bags and some clothes for my daughter. When Ginger #2 was on the way in 2011, I became obsessed with sewing and sewed all of her newborn clothes and blankets. My Wal-Mart sewing machine became overworked, and I eventually bought a Kenmore sewing machine from Sears. This is exactly the same as a Janome. I love it. It is a great machine, and it is amazing how having a good machine will change you. I didn't like quilting, until I tried to Free Motion Quilt (FMQ) on my domestic machine. That was it! My husband's cousin saw my FMQ on facebook. She had just bought a Handiquilter Sixteen, a midarm machine, from a friend for $300. $300?! Yes! The machine had been in a house fire and had been damaged by smoke. It needed to be cleaned up, parts needed to be replaced, and it needed a table. My husband's cousin thought I would use the machine and that Mr. Ginger and I would get it working. My heart jumped when she said I could have it. I was so excited. I still can't believe it. We didn't even know if it would work, but it did. It worked beautifully when we got it cleaned up. So now I've been happily quilting since early 2013. 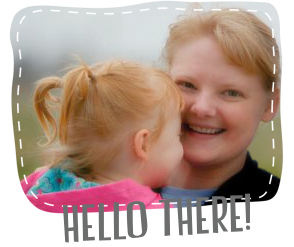 I started blogging in August 2013 when Ginger #1 started Kindergarten. Hence the name Good Golly Ginger. Both my daughters are red headed. Ginger #1 has just a slight tinge of red, but Ginger #2 is a full-blown ginger. In June of 2015, I upgraded longarm machines to a Handiquilter Fusion with ProStitcher. The HQ16 went back to my husband's cousin, and they are very happy together. I now offer over 1000 computerized designs, and I still offer my original free-motion quilting designs. With 24 inches of throat space on the Fusion, I am thrilled to offer customers more options, and will help you find the perfect motif for your quilt. Thank you for visiting my blog. If you would like a quilt top quilted, then please email me. More information and the longarm quilting contract can be found here. Thank you for being a part of Sew Mamma Sew giveaway this week. You have a giveaway to die for. This is what we all want and why we participate in this giveaway. I am the same way and hoping so much to win something, anything. Hey Katie! Just found your blog from a link on Kelly's (My Quilt Infatuation) email (just found her the other day)!! I love your Gypsy Wife quilt and your whole web site!! I too was a computer science major and started quilting in '08!! I look forward to following you! !